Whether you decide to host a neighborhood party, have a small get-together, take the kids to community events, or just cuddle up with your family by a fire and a movie, this New Year’s Eve can be one to remember with these tips for a kid-friendly celebration. You can have a fun time with the whole family while being safe this New Year’s Eve. Let me share with you three New Year’s Eve ideas for families to get you thinking and planning for your own big night. Many children can’t, won’t, or shouldn’t stay up until midnight to help you count down to the new year, so start counting around noon. Hey, it’s always midnight somewhere, right? 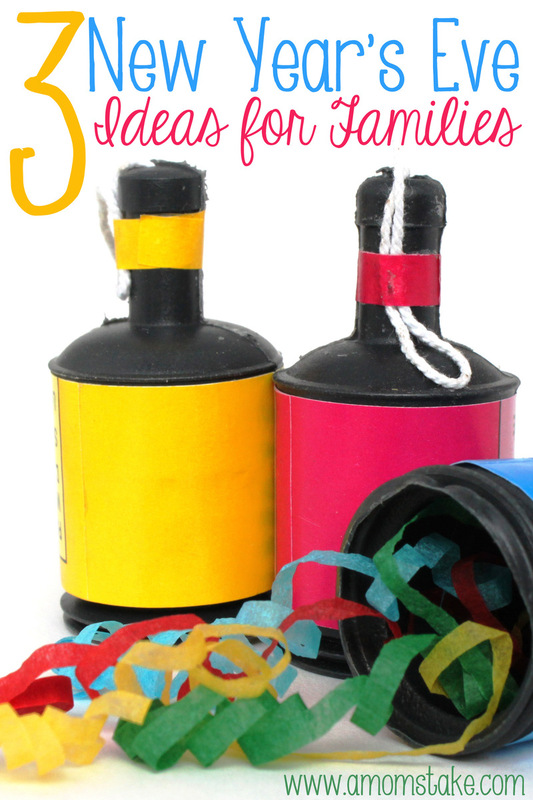 Hold a celebration by including noisemakers, serving sparkling cider and giving a toast. Help younger children remember the numbers to countdown with by providing flashcards as visuals. After you have celebrated the noon hour, have pizza and party food, watch a movie, hold a dance party, or any other activities your children may enjoy. Go online or turn on the news to see how other areas are celebrating the new year. This will also free up your evening to invite friends over or to have your own private celebration. You can invite your friends over for a party- and have little ones there, too! Have a slumber party with the kids by planning a whole host of games and fun. Provide silly hats, feather boas, and big glasses. Have champagne flutes of apple juice, and appetizers of pizza bites and chicken nuggets. You can play a “Hide the Clock” game and have an adult hide a ticking clock. Give the kid three clues to finding it and the child that finds it gets a prize. Keep the New Years Eve in Times Square celebration on television for great music and fun watching how everyone else is celebrating. While the kids have fun at their party, the adults can have fun partying just a room away. If your kids are old enough to stay up for a celebration, plan a quiet party for just your family. Go to a local fireworks show, which are generally free, stop some place nice for dinner, and as you’re eating have each person in your family tell everyone what they liked most about the previous year. You can also discuss what you disliked about the previous months and what you hope to change in the upcoming months of the new year. When you get home, turn on some music, take down the Christmas decorations, and continue discussing your resolutions for the year to come, what you hope for, and how you plan to make things new and different. After the decorations have been put away, make a ball to drop at midnight. Buy a large Styrofoam ball, glue, and sequins at the craft store and decorate the ball with the sequins. Suspend it from the ceiling using ribbon. At midnight, cut the ribbon and have fun watching the ball drop. What are your New Year’s Eve Ideas for families?